Over the last 25 years, there has been a dramatic shift in the types of refrigeration systems carried aboard cruising boats. Today, 12-volt systems prevail, but the systems most often installed up to the late ‘90s were driven by the main engine. Engine-driven refrigerators function just like the air-conditioner in your car, with a belt-driven compressor forcing a refrigerant gas through a typical vapor-compression cycle. Though it’s typically one of the less-understood onboard systems for boat owners, an engine-driven system consists of only a few key components—a compressor with a clutch activated by an electric timer, a condenser (usually by the engine’s raw-water pump), an expansion valve, an evaporator (inside the holding plates) and some lengths of copper tubing. One of the key advantages to engine-drive systems is that they are self-supporting and don’t rely on an electric compressor, so there is no additional drain on the batteries. However, unless an engine-driven system is fitted with a secondary electric compressor, the engine must be run each day to keep the fridge cool, which can be a problem for boats that spend most of their time at the dock. Still, for active cruisers or charter boats, an engine drive system perfectly satisfies the need for reliable and powerful refrigeration. “People who still have these systems love them,” says Cleave Horton of Sea Frost Refrigeration, who has produced hundreds of engine-driven systems. Nigel Calder, the author of the Boatowner’s Mechanical and Electrical Manual, agrees. “Hang onto them as long as they keep working OK and then rip them out the minute they begin to act up in a way that requires the system to be opened up,” he says. Another potential problem with engine-driven systems is that they can be very expensive to repair. Horton noted that many of these legacy systems cost as much as $10,000 when they were originally installed. However, 30 years later, the same boat might be resold with an aging system to a new owner for less than a quarter of its original value. The new owner is unlikely to want to spend thousands to repair an engine-driven system, regardless of its initial value. Bottom line: in many cases, if your boat has a non-functioning engine-driven system installed, it probably makes more sense to just scrap it and install a newer, much cheaper 12-volt system. It’s important to remember that an engine-driven system is self-supporting and places no ing drain on your house batteries. Therefore, if your boat does not also already have an upgraded electrical system with sufficient battery capacity and charging sources for running a 12-volt system for an extended time away from the dock, you must consider this cost when adding 12-volt refrigeration. Indeed, adding a refrigeration unit without sufficient means to support the electrical load will cause many headaches and a much greater strain on your wallet in the future. With this in mind, can it be cost-effective to repair your engine-drive system? If a system hasn’t been abused by running without a charge, and if it’s been kept clean and free of corrosion, you can probably bring it back. The first step then is to assess what’s wrong, so you can make an educated decision on how to proceed. Here are some things you can do to help determine the status of your system. 1. Check for corrosion: Do the components and tubing look like they’ve been bathing in salt water for 20 years? Check under any insulation that covers the tubing. If your components are badly corroded, I would stop here. Remove and replace with a new 12-volt system. 2. Check the compressor: With the breaker for the system off and the engine stopped, use your fingers to turn the faceplate on the compressor. The clutch pulley (the disc with the belt around it) should remain stationary, while the face plate should turn freely and smoothly by hand. If it does, your compressor is good, and you can continue to Step 3. If not, replace it with a new system. 3. Check the clutch: With the engine off, engage the fridge timer or switch. An indicator light should be lit to ensure the power is on. You should also hear a click. Try spinning the faceplate with your fingers; it should now be locked in place, unable to turn. If it still turns, be sure you have power to the clutch. It should draw about 3 amps. When the clutch coil fails, it draws more current. Do you have a bad clutch? Stop and replace it. A new clutch coil can be found for $30-$50. 4. Is your system charged with R-12 (Freon) refrigerant gas? If you have a system with a newer gas like R-134a, continue to step five. Most systems used R-12 refrigerant prior to the 1994 EPA phase-out.Technicians who service R-12 systems can be hard to find. If you do find one, make sure they recharge the system with genuine R-12. 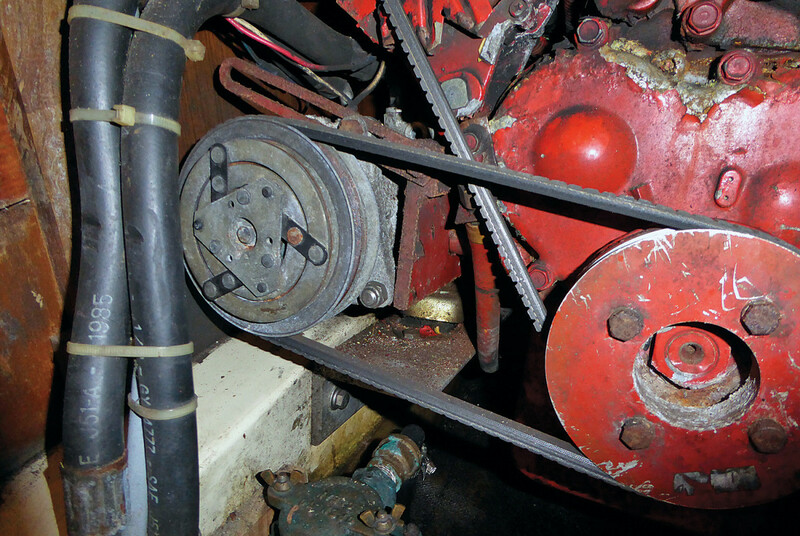 Retrofit gasses have proven to be destructive in marine holding-plate systems. Simply recharging the system does not rule out the possibility of problems with other components. Repair is generally not cost-effective, replacement with a new system is advised. 5. Check the sight glass: Follow the copper tubing from the engine compartment to the icebox. A quality system should include a sight glass for viewing the flow of refrigerant. Position yourself so you can look into the sight glass and have a friend start the engine and rev to a high idle (900-1,200 rpm). After that have them engage the fridge timer or switch to activate the compressor clutch, which should cause the engine to load up and slow down slightly. While monitoring the sight glass continually, you should see a white foam develop, then transition to clear. If you do not see foam, shut down the system immediately as it does not contain a charge. If foam is present but does not transition to clear, the system is low on charge. Continue to Step 6. 6. Find leaks and recharge: Congratulations, you have a leak! Fear not, some leaks are no big deal. If your system has been sitting for many years, you might have a tiny leak from a fitting that was never properly tightened. A system that has a slow leak of only an ounce of gas a year may hold its charge for many years. A faster leak is an indication of corrosion in the system (refer back to Step 1). At this point, truly courageous DIY’ers may be able to track down said leaks and even recharge the system without paying for help. Either way, if you’ve made it this far, I recommend foregoing replacement. Instead, pay a refrigeration professional to recharge your system, at the same time communicating your findings from steps one through five to prevent them charging extra for time spent repeating your diagnosis. With luck, when they’ve finished your system will work just as well as it did when it was new. Phil Gutowski has a passion for marine electrical and mechanical systems. He runs his business, BoatRx, out of Boston, MA.